Ice cream alone is a treat, but we all know that sundae toppings are where it’s really at. For this Black Forest Sundae specialty, make homemade Bing cherry sauce and hot fudge — store-bought versions just don’t even compare. Both the Bing cherry and hot fudge sauce can be made ahead, chilled, and rewarmed in a microwave or double boiler before serving. You want them to be warm enough to contrast the cold ice cream, but not so hot that they melt it on contact. For the cherry sauce, simmer cherries, sugar, ¼ cup apple juice, wine, lemon juice, and a pinch of salt in a saucepan over medium heat. Combine 2 Tbsp. apple juice and cornstarch in a bowl until smooth; whisk into cherry mixture and simmer until thickened, about 3 minutes. Let sauce cool at least 10 minutes before serving. For the hot fudge, combine sugar, cream, cocoa, espresso powder, and a pinch of salt in a saucepan. Bring mixture to a boil over medium-high heat, stirring constantly. Boil fudge 3 minutes, stirring, then remove from heat. Let fudge cool at least 10 minutes before serving. 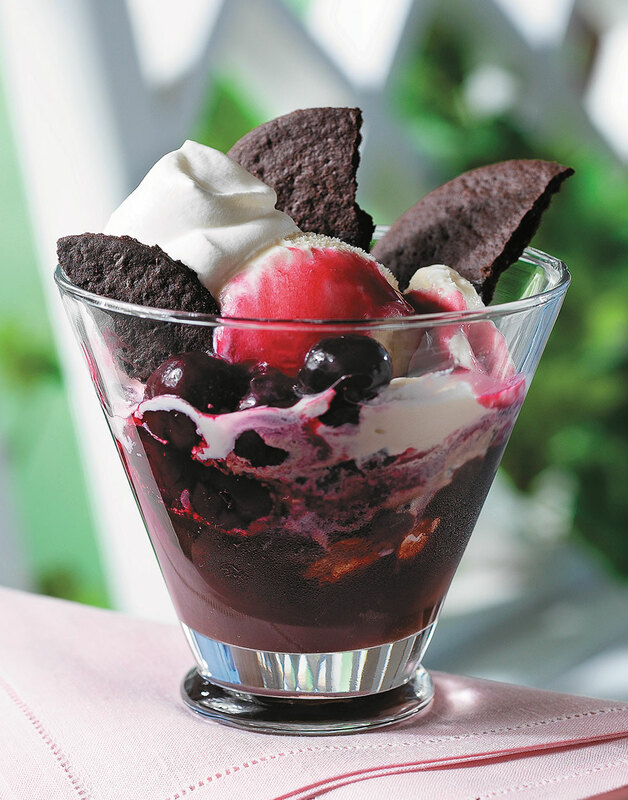 For the sundaes, layer 2–3 scoops ice cream with cherry sauce, fudge, and crushed cookies in each of eight serving dishes; garnish with a dollop of whipped cream and cookie halves.